Buying your own home and buying rental property couldn't be more different. 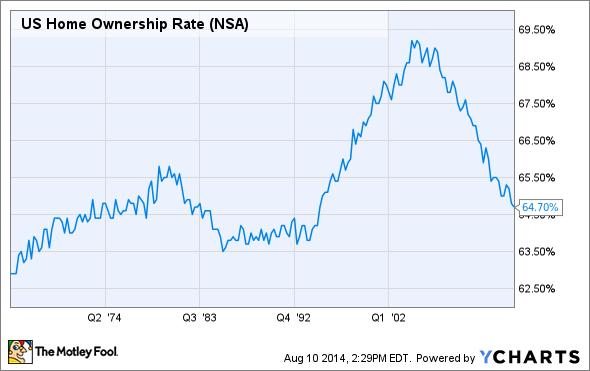 Just under 65% of American families own their own home. There are about 115 million households in the U.S., meaning that approximately 75 million of those households own their own home. That number has wiggled between 63% and 69% over the past 50 years. Put more simply, a whole lot of people have experience buying real estate. But just because you've bought a single family residence for yourself or your family in the past doesn't mean you're ready to buy rental real estate for your investment portfolio. On the surface, the differences are not all that apparent. The buying process is essentially the same: Find a home. Hire a real estate agent. Make an offer. Get a loan. Wait on the appraisal, and close the deal. None of those steps really change. However, these similarities are purely superficial. From the first step to the last step, the underlying logic is dramatically different. The key -- the single most defining difference -- is the understanding that when you buy rental property you are not buying a place to live. You're buying a business. Location, location, location...of your business The first rule of real estate is location, and there's no better place to really illustrate the difference between buying a place to live versus buying a business. When you bought your own home, you almost certainly considered the location where you wanted to live. You considered school districts, neighborhoods, and proximity to amenities. Your final decision was based on you and your families priorities. You will consider the same factors when buying a rental property, except the priorities have nothing to do with you. You may prefer a suburban neighborhood away from the hustle and bustle of the city. Or, you may even prefer to live downtown, close to city life or perhaps your job. The thing is, your future tenants don't care that you personally prefer to live in the suburbs or downtown or close to your job or, for that matter, anything else about you. They will only rent your property if it fits their priorities. Your rental property is a business, and a business needs customers. Therefore, you have to think about your customers -- your future tenants -- first. Putting your customers first boils down to two elements: who are your target customers, and what do they want? Buying in a college town? Will your business find success renting to undergrads or graduate students? Or perhaps you should target professors or university administrators? Undergrads may value proximity to campus (or perhaps proximity to the night life scene), while graduate students may value a quiet area at a low price point. The professionals may prefer a neighborhood away from students that offers a more stable community of similarly aged families. Your decision on a rental property purchase hinges on who you define as your target tenant. It will impact your thinking on the location of the house, the style, the size, the marketing, and everything in-between. This purchase is an investment; it's not about you, it's about business. As an investment and as a business, the only time buying a rental property makes sense is when the property can generate an adequate profit. In your home, you may place a huge importance on having a large chef's kitchen. To you, that room may add a significant value to your comfort and quality of life. Paying a little extra to get that may make sense for you personally just because it would make you happier -- and hey, the intangibles matter! But what about in your rental property? It may, but it may not. If that fancy kitchen costs an additional $10,000 to install, yet you can only fetch an additional $100 per month in rent with that feature, then is it worth it? Absolutely not. At that rate, it would take over 8 years to recoup the cost alone. That kitchen may be beautiful and top of the line, but in this case it's also bad business. Buying rental real estate can be a very satisfying and potentially lucrative investment strategy. The key is to think of each purchase as a business, not as a place where you will live. Just like you would consider the business fundamentals of a company before you bought stock, you must consider the business fundamentals of each property before you buy. At the end of the day, it really is business, not personal.